Left: Rev. Irene Matsumoto conducts a service in front of the Ehime Maru memorial. Right: Tatsuyoshi Mizuguchi, who lost his son in the accident. The families of the lost crew members place leis on the memorial. 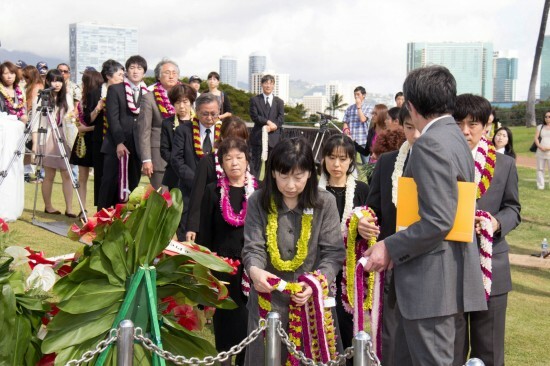 HONOLULU — U.S. and Japanese dignitaries gathered Honolulu on Feb. 9 to mark the 12th anniversary of the Ehime Maru tragedy. On that day in 2001, the Uwajima Fishery High School training ship Ehime Maru and the U.S. Navy submarine USS Greeneville collided and nine Japanese crew members lost their lives, including four students. The ceremony was held at Kakaako Waterfront Park, where a memorial was erected to the lost crew within sight of the scene of the accident. Participants included 19 family members — among them Tatsuyoshi Mizuguchi, father of Takeshi Mizuguchi, whose body was never recovered — and members of the Japan Maritime Self-Defense Force. The service began with a prayer by Palolo Hongwanji’s Rev. Irene Matsumoto. Speakers included Ehime Vice Gov. Keiji Joko, Hawaii Gov. Neil Abercrombie, and Honolulu Mayor Kirk Caldwell. Rear Adm. Scott Welkert of the U.S. Pacific Fleet and Consul General of Japan in Honolulu Toyoei Shigeeda was among those laying wreaths at the memorial. 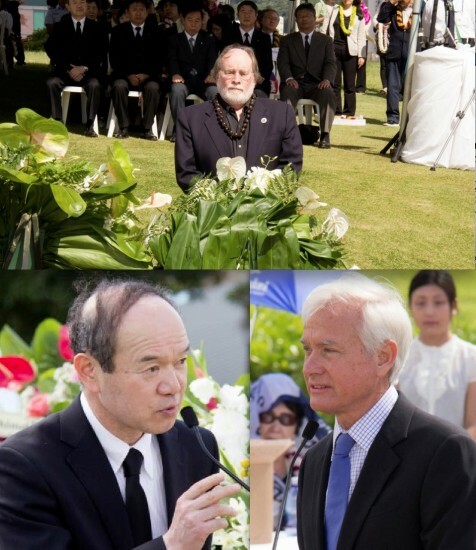 Speakers emphasized that the accident, which made international headlines and was found to be the fault of the submarine’s commander, could have resulted in blame and hostility, but instead led to increased goodwill and exchange between the U.S. and Japan, specifically Hawaii and Ehime Prefecture. The Ehime Maru Memorial Association, associated with the Japan-America Society of Hawaii, maintains the memorial, assists the bereaved with annual memorial services, and promotes Ehime-Hawaii relations through educational and cultural programs. Edwin Hawkins, the association’s president, told Hawaii News Now that this year’s observance, the 13th anniversary (Jusankaiki) according to Buddhist tradition, brings “some kind of closure” for the families, and there may not be another formal ceremony. Top: Hawaii Gov. Neil Abercrombie. Lower left: Ehime Prefecture Vice Gov. Keiji Joko. Lower right: Honolulu Mayor Kirk Caldwell.